But how could Eells achieve his vision? He’d need some help. “The first step was to select a very few of the most influential members of each literary society, to open to them cautiously the outlines of my plan, and list their co-operation. To my surprise, all approved it, and engaged in the undertaking with the utmost ardor,” Eells later wrote. These influential members, Lorenzo Latham, Henry Lemuel Storrs, Oliver Andrew Morse and John S. Underwood, agreed to meet with Eels on a cold, winter evening in 1831. Under the darkness of night—only after evening lamps had been lighted—they congregated in Eells’ dormitory room. “Secretly, and without any formal meeting, we pledged ourselves to the work. The first meeting was held at my room, No. 15, Back Middle, Kirkland Hall. All the persons selected were present; but as it was only a meeting for consultation, no presiding officer was appointed and no minutes were taken,” Eells recorded. These were the humble beginnings of our fraternity, Alpha Delta Phi. Eells himself later drew up our Constitution and a golden badge in the shape of a Star and Crescent. Truly, the foundation of the modern Alpha Delta Phi was born—“a society of a higher nature and more comprehensive and higher principle.” The year was 1832. Meanwhile, not more than 100 miles away in Ithaca, New York, a school founded by Ezra Cornell and Andrew Dickson White opened its doors to students in the fall of 1868. Cornell University, founded on the motto, “I would found an institution where any person can find instruction in any study,” was revolutionary in its aim: to educate its students in any form of knowledge without regard to gender, race, religion or wealth. It was shortly after the University’s founding that several national fraternities began taking steps to organize chapters at the new institution. Alpha Delta Phi was one of them. In January of 1869, only six months after students had arrived on East Hill, seven Alpha Delt alumni of other chapters who lived in Ithaca completed the formation of our Cornell chapter. These men chose our fraternity’s first twelve members: Dewitt Clinton Johnson Bingham 1870, Thomas Castle 1872, Frederick Lee Gilbert 1871, Samuel Dumont Halliday 1870, Harvey Judson Hurd 1872, Chester Hicks Loomis 1872, William Workman Lyon 1872, Walter Scott MacGregor 1871, George Henry Phelps 1871, Morris Morris Ross 1870, Henry Hale Seymour 1871 and Henry Graves Wells 1872. In February 1869, the Cornell Chapter’s charter was granted. Bingham, originally from Des Moines, Iowa, later became a journalist and editor and was also the U.S. Consul to Aix-la-Chapelle, Germany in 1893. Castle, from Buffalo, New York, pursued a career in jewelry, while Gilbert, a man from Duluth, Minnesota, would work as a lumber manufacturer and shipbuilder. A native Ithacan, Halliday attended Law School and become Tompkins County’s district attorney. He also served as a University Trustee from 1874-1884 and a member of the New York State Assembly in 1876 and 1878. A career as a lumber and brick merchant awaited Hurd, from Elma, New York, as he later served as president of the Buffalo Board of Trade in 1894. Loomis, originally from Englewood, New Jersey became an artist after studying under Lion Bonnat in Paris from 1867-’75. Both Lyon, from New York, New York, and MacGregor, from Syracuse, New York, pursued careers in law, while Phelps, a Bostonian, became the manufacturing executive of the George Frost Company, makers of patented underwear and notions. 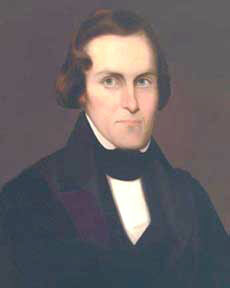 Ross, of Indianapolis, Indiana, pursued journalism and later became managing editor of the Indianapolis News; Seymour, of Buffalo, New York, became a lawyer; and Wells, born in St. Louis, Missouri, was in express and shipping business for a short time before his health failed and he died in 1878. With no chapter house yet built, ten of the fraternity’s charter members were initiated on March 19, 1869, at the Rochester chapter—with assistance by brothers from Hamilton and Hobart Colleges. Bingham and Halliday had been previously initiated at the Hamilton chapter. The new Alpha Delta Phi was the fourth fraternity at Cornell, following closely chapters of Zeta Psi, Chi Phi and Kappa Alpha. Similar to other fraternities who rented social rooms and lodging in the city’s business district, Alpha Delt’s rooms were located on Tioga Street in downtown Ithaca. On May 3, 1869, Alpha Delt moved into new quarters at the intersection of State and Tioga Street and held its first regular meeting. These rooms were next door to Wilgus Hall, Ithaca’s one and only opera house. Throughout the 1870s, Cornell grew slowly, but fraternities proliferated; in 1878 there were ten chapters for a mere 400 students. Several fraternities began making plans for the construction of new chapter houses. The Alpha Delts had gotten wind of these expansion plans of their rival groups, and urged their alumni to raise the funds necessary to give the fraternity the first of these new permanent houses. Taking advantage of the relatively low land and construction costs in the somewhat depressed economy of 1877, a group of alumni collected $12,000 for the erection of a new house on Buffalo Street at Schuler Place. The lot was ideally situated, according to Blake Gumprecht, a geographer at the University of New Hampshire who has studied Alpha Delta Phi’s various lodgings, because “at the time most Cornell students lived downtown and walked up Buffalo Street to campus, passing by the Alpha Delta Phi house.” To Brother William Ely Bramhall 1877 is due the credit of having originated the idea of a new fraternity house and passing the idea successfully, even when every other member was opposed to it. With the aid of Brother Theodore L. Mead 1877, by the spring of 1878, plans were drafted from which the house was finally built. With ground broken at midnight on June 10, 1878, and completed in time for the start of the school year that fall, it was the first, and very visible, fraternity chapter house at Cornell. It is believed that the large brick structure, lodging a mere sixteen brothers in a state of spaciousness and luxury that would be impossible today, was the first house to be built in America for fraternity use only. And the rent for these brothers: a mere $2.50 per week. The handsome Buffalo Street house served the fraternity for 25 years and was later purchased by Ithaca College for use as a dormitory. It still stands today as an apartment house. 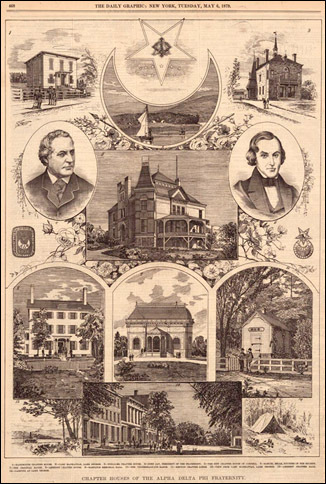 An 1879 feature on the homes of Alpha Delta Phi, as published by the New York Graphic. View more vintage photos in our historical archive. For access to historical speeches by key Alpha Delta Phi leaders, and other fascinating digital archives, click here. A study by Blake Gumprecht, University of New Hampshire. Download the PDF here. Download the PDFs here, here, and here.